Below is our pea timevine, covering over 160 years of pea research. 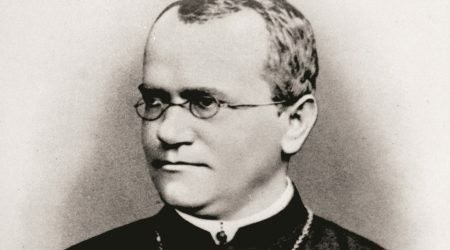 Gregor Mendel’s pea breeding experiments established the basic understanding of the mechanism for inheritance. William Bateson, the first director of the John Innes, later introduced Mendel's theory and the discipline of genetics to Great Britain. 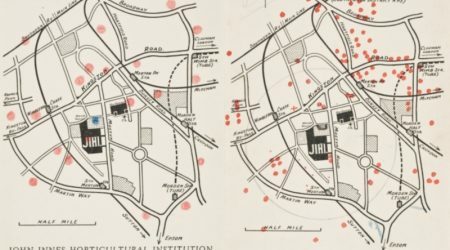 The John Innes Institute opened in 1910 and William Bateson began using pea in his research programme to further Mendelian genetics and test the emerging chromosome theory. This marked the beginning of pea research at the John Innes, which continues over a century later. 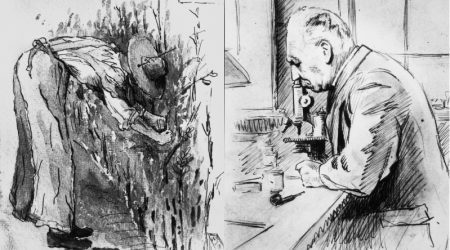 Many refer to William Bateson’s fundamental role in developing the study of genetics, but few recognise that his research group consisted primarily of women, some of whom were central to the development of pea research at the John Innes. Initially, pea research at the John Innes focused on demonstrating and extending the principles of Mendelian inheritance. 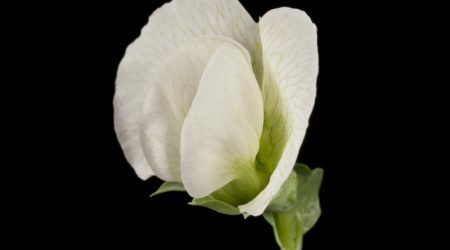 However, an exception emerged; the rogue pea posed an entirely new and unique enigma as it defied all emerging rules of inheritance. Over 100 years later, scientists are yet to solve the mystery of the rabbit-eared rogues. 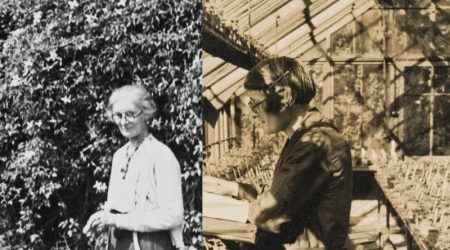 The Second World War had a dramatic effect on John Innes pea research due to changing priorities, depleted staff and a lack of available funds. Consequently, pea research was put on hold and ceased to appear in the Institute’s annual reports for two decades. 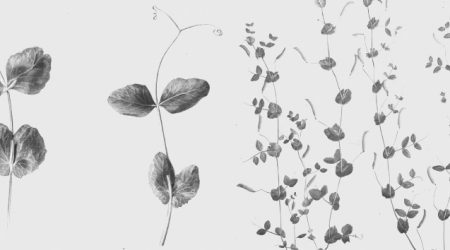 While examining the newly acquired John Innes pea collection, Kenneth Dodds observed a particularly peculiar trait: some pea pods were developing unfamiliar genetically controlled tumours or ‘neoplasms’. But what were these bizarre pustular-like growths, and why did they form? 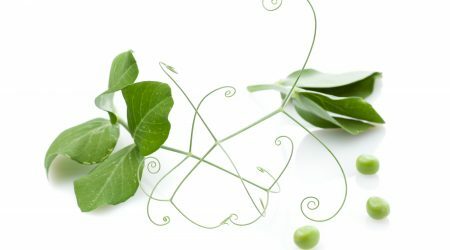 The ‘semi-leafless’ pea can be considered one of the most important achievements in the history of pea breeding, and one of the most successful applied research outcomes at the John Innes, in collaboration with others. This new pea line addressed several problems facing the pea industry, and impressively now accounts for 100% of UK dry pea production. As a crop, pea offers a wide range of health and environmental benefits, yet pea seed-derived products remain underutilised. One possible reason for this is due to pea lipoxygenase enzymes, which contribute to undesirable off-flavours. A pea line identified by John Innes researchers in the 1990s, which lacks one of these lipoxygenases, could prove its value now that pea products within the gluten-free market are undergoing an expansion. 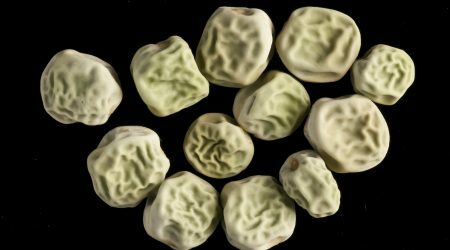 The 130 year-old mystery of the genetic basis for Mendel’s wrinkled peas was solved by John Innes scientists. 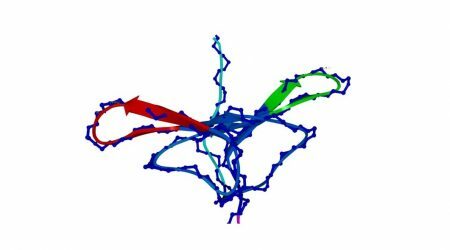 They found that the trait studied by Mendel is linked to an enzyme (SBEI) involved in starch biosynthesis. The SBEI gene is inactive in wrinkled peas, disrupting starch production and resulting in the wrinkled pea seed appearance. 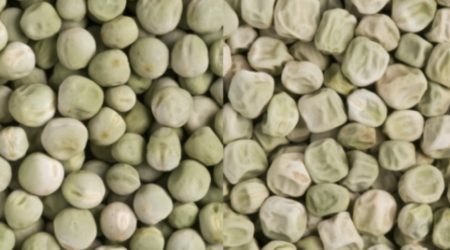 Extending the work on wrinkled peas and starch content throughout the 1990s, John Innes scientists identified and studied five mutants that influence the seed shape and starch content of pea seeds. One mutant has such a dramatic effect on starch that it produces ‘super-sweet’ pea seeds. 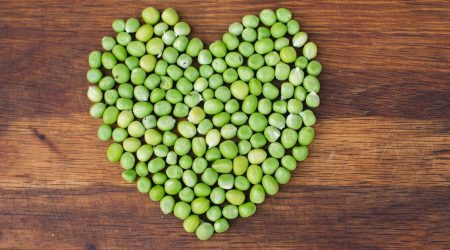 Could pea protein help combat cancer? John Innes research indicated that a group of enzyme inhibitors found in pea seeds could help prevent and suppress cancer and inflammatory disorders in the colon. 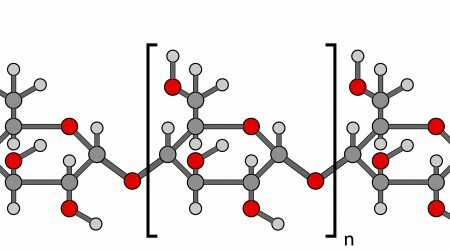 Pea starch: an alternative material to plastic? 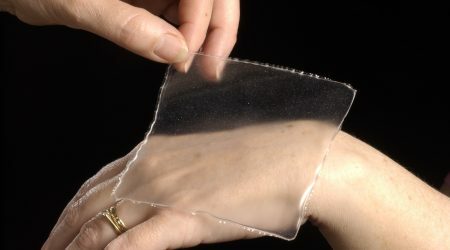 How would you feel about wrapping up your sandwiches or applying a dressing to a wound using a product derived from pea? Scientists at the John Innes explored these possibilities using pea starch. 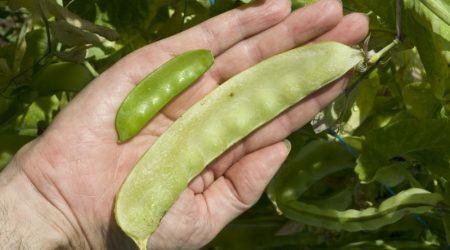 Mike Ambrose, of the Germplasm Resource Unit at the John Innes, potentially grew the world’s largest mangetout pea pod. 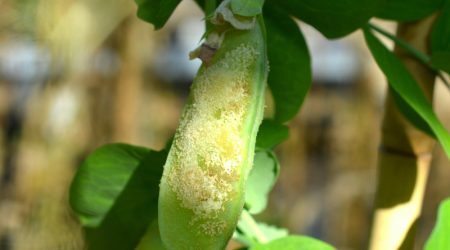 John Innes scientists developed a ‘super pea’ that is predicted to enhance protein digestion in humans and livestock. The pea lacks 'trypsin inhibitors', which slow down or impede protein digestion. 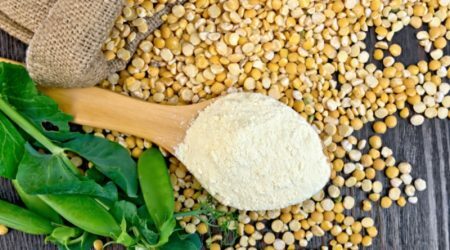 The ‘super pea’ has potential significance as a high protein food source, which could help reduce the UK’s dependency on soybean imports, as well as having many other benefits. 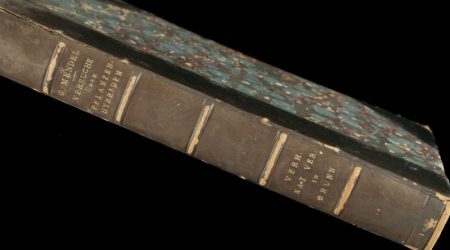 This year marked the 150th anniversary of the publication of Gregor Mendel’s revolutionary “Experiments on plant hybrids” paper, which has been credited with laying the foundation for science-based agriculture and many plant breeding techniques. Find out how the John Innes Centre has been involved with understanding the molecular basis for some of the pea traits that Mendel observed during his famous pea breeding experiments. Could pea seed products help defeat diabetes? Some pea seeds contain dietary starches that ‘resist’ digestion and evidence suggests that this resistant starch could help combat type 2 diabetes; a chronic health problem in the UK.  Working with partners, the John Innes Centre has contributed their genetic understanding of pea seeds and starch mutations to help provide new insights.